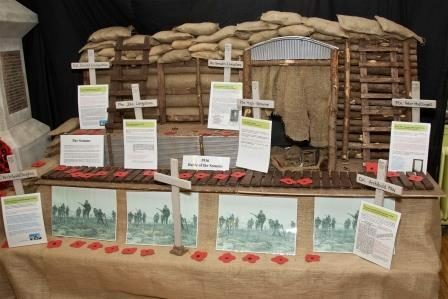 Helen Glennie, Ron Hetherington and Colonel Tim Sinclair came into give us a talk on Remembrance and showed us a display. Helen told us about some of the people who were from Seil, Easdale and Luing who died in World War 1. Tim told us about why we do remembrance and what it is for as well as why we wear poppies. Tim came in his uniform and told us about his medals and rank. Parents came to Easdale School to find out about what pupils have been learning. We invited the adults to join us for breakfast. 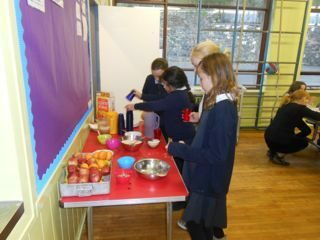 There were lots of healthy breakfast foods to choose from. 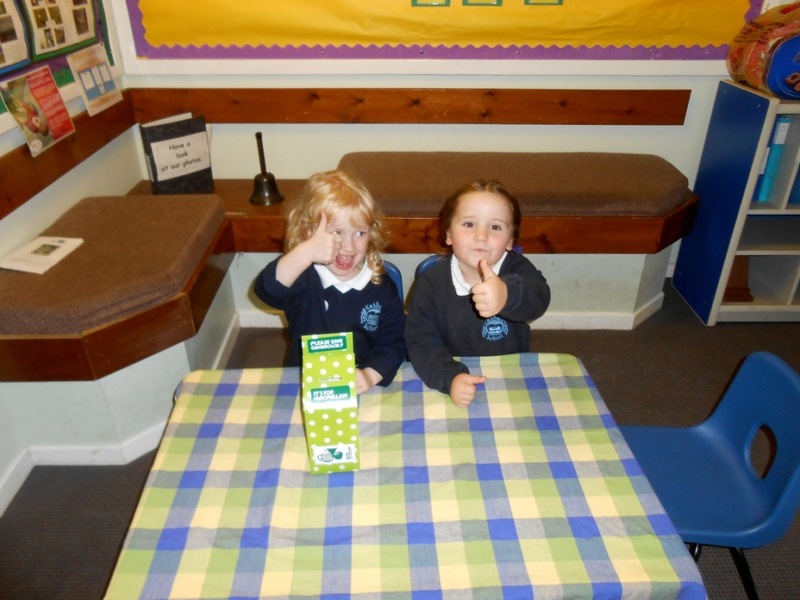 Mrs MacKechnie and Mrs MacLarty helped us by setting up the kitchen and hall. Thank you to Tesco for the food donations for this. 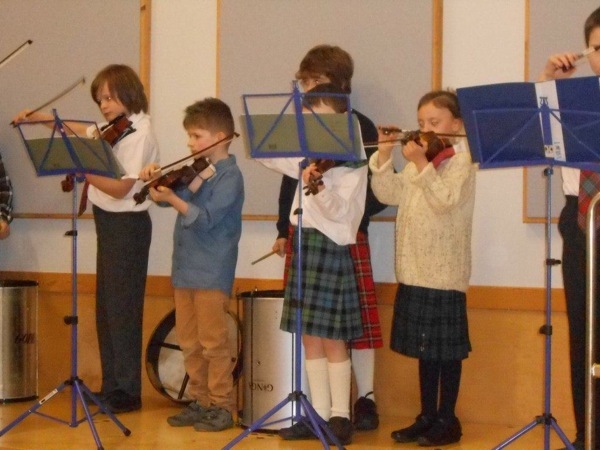 On Monday 30th November Easdale Primary School celebrated St Andrew’s Day with a Community Ceilidh in Seil Community Hall. Our Strings Orchestra led by Miss Hazel Clark played a selection of tunes. All the children sang some Scottish songs and led the Scottish dancing. Luing and Easdale pupils enjoy a trip to Oban Airport! 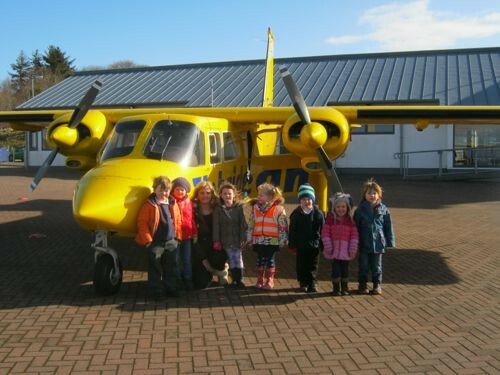 Early level pupils from Luing and Easdale decided to visit Oban Airport as part of their transport topic. They enjoyed looking around the air traffic control tower before watching the Colonsay plane land! They were even allowed to sit on the plane. The firemen at the airport then showed the children their special fire engine and let them sit in the driver’s seat with the flashing lights on. The firemen also demonstrated how far the water shoots out from the hose. The children were excited to watch a helicopter landing. We all had a wonderful day! Congratulations to Aaron MacLarty from P3 Easdale Primary who was awarded a Special Merit in the Tesco Bank Art Competition. There were over 7,000 entries from all over Scotland so to be amongst the winners was a major achievement. His winning entry, a collage of a soldier drumming, will be displayed at the Scottish National Gallery Edinburgh from 7th June – 28th October. 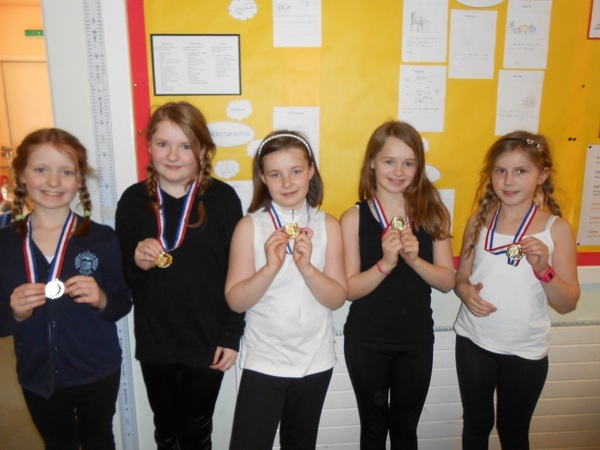 P5-7 travelled to Oban High School to take part in this years gymnastics festival. With guidance from Mrs Liz Clunie our PE specialist, all pupils in P5-7 have been working hard to create fantastic routines, supporting one another and giving constructive feedback. 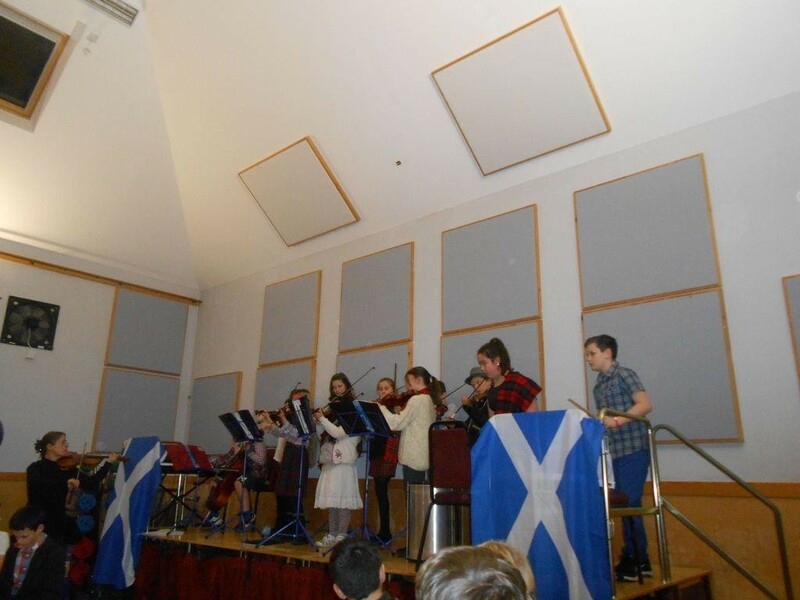 Three groups from Easdale performed on the day and one of our groups were awarded 1st place in the rural schools category. All three groups performed very well. The children also enjoyed watching performances from Oban High School pupils. 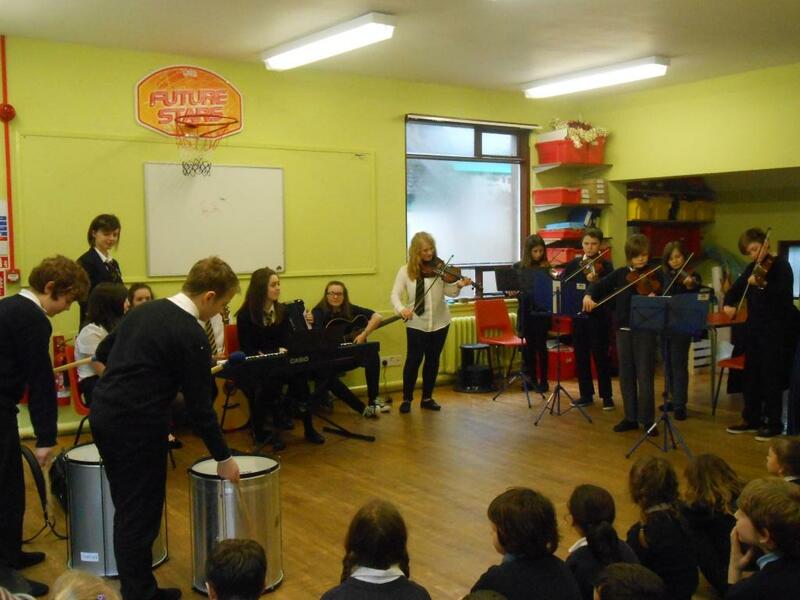 A huge thank you to the fabulous Traditional Music Group from Oban High School for visiting our school last Wednesday and playing for us. Their audience ranged from Pre 5 to P7 and was very much enjoyed by pupils and staff. It was a great opportunity for the older members of our school strings orchestra to play along prior to their own performance at our Burns Celebration. We enjoyed an excellent finale with The Traditional Group playing and the whole school dancing the Gay Gordons. Easdale Primary Pre 5 have been out and about investigating different modes of transport. 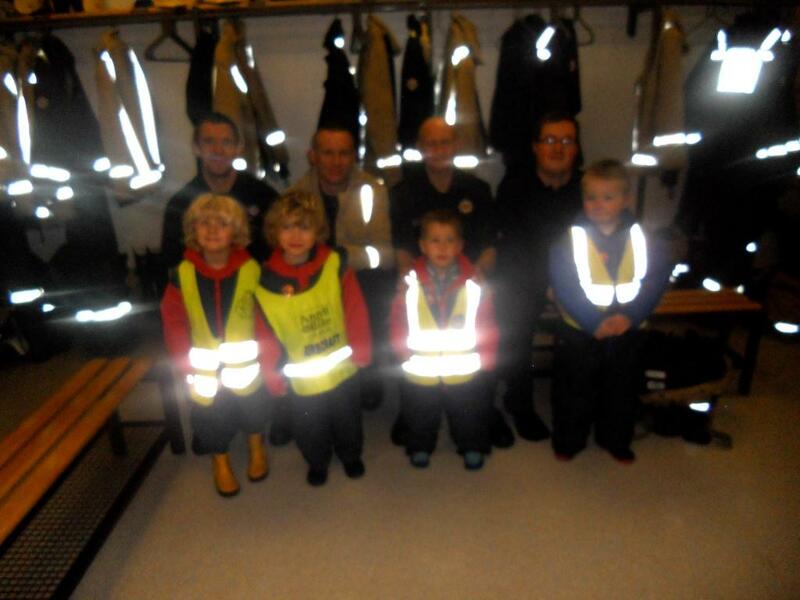 Over the past few weeks they travelled to Oban on the bus and visited the Fire Station and Lifeboat Station, popping into the CalMac and Scot Rail offices to collect time tables. PC Moore came into school grounds with his police car. The children were very enthusiastic and asked lots of questions about the vehicle and rescue equipment. Their topic will hopefully end with santa and his sleigh. 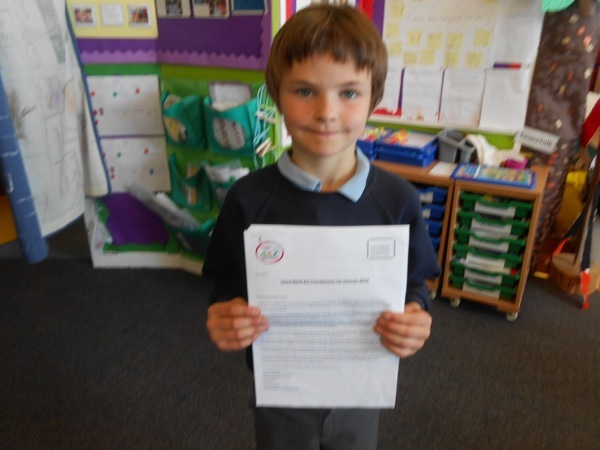 Congratulations to Charlie Nathan, P7, who came 6th in the Autos category of Motorcross. 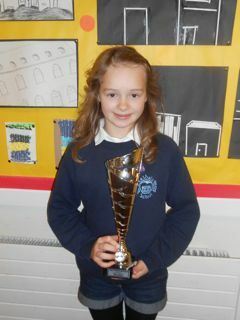 Charlie only took up the sport this year and last weekend received a trophy to show her achievements this year. Well done Charlie! 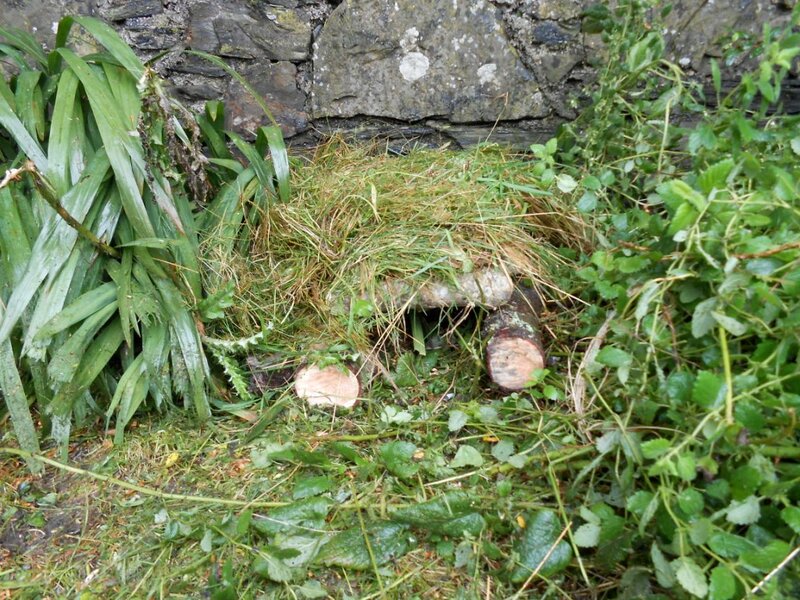 Easdale Primary’s Early Level Class have been learning about hedgehogs and Mr. Gordon McColl came into school to help us build a hedgehog house in our school grounds. Well done to the children in Easdale Primary who planned and organised a coffee afternoon to raise funds to support Macmillan Cancer Care. Thanks to the support of parents, friends and the wider community we raised the fantastic total of £234.21. Staff, children, parents and community members gave up the first week of the holidays to decorate the gym hall in Easdale Primary. The hall is half gloss so the preparation took 2 days before any paint could touch the walls. 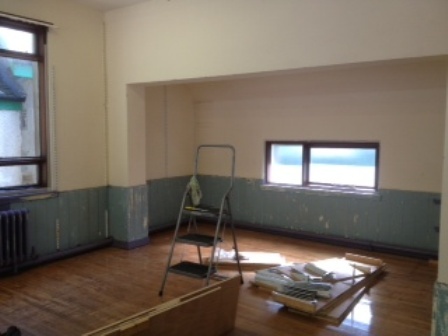 A full undercoat followed by a full decoration has left a perfect Gym hall for the children and staff in the school. Mr Glen-Lee was in his element filling the bins making sure only quality resources returned to the shelves. 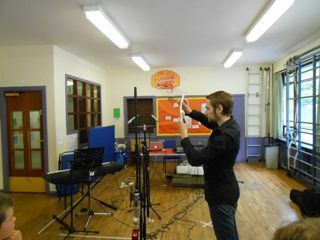 There was a musical buzz in Easdale School when Guy Forteith came along to record the children singing and playing music. It was really interesting to see all the equipment set up to record. We were amazed how much was needed. Thanks to Hazel Clark our strings instructor for all her hard work with our school orchestra who feature on the CD and to Ann Barlow for accompanying the singing. 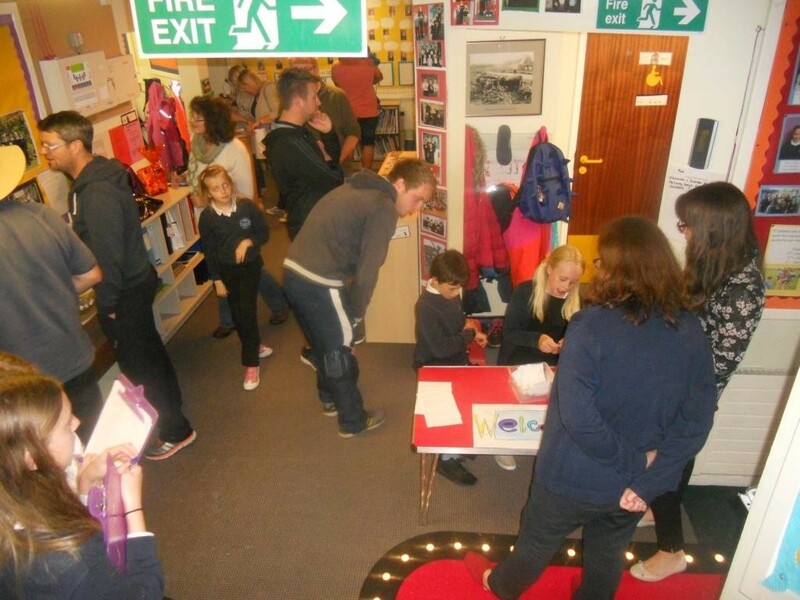 Easdale Primary School held an open morning to show Parents their curriculum in action with examples of what and how they learn. 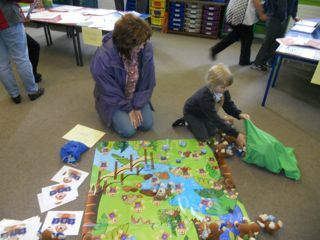 The morning which was planned by the children and very well attended by Parents was voted a huge success. 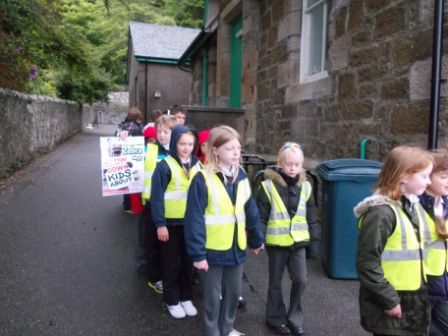 All the children in Easdale Primary took part in a walking bus to the village of Ellenabeich and back to school to practise their road safety and support Brake road safety charity. Our safe walking and road safety posters made cars more aware and slow down to a safe speed. 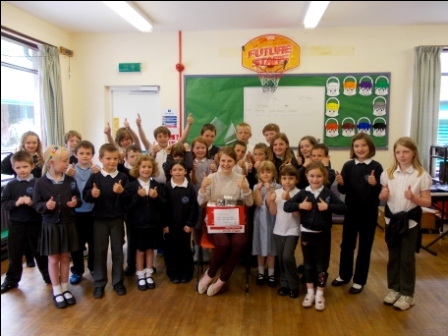 The children in Easdale Primary kindly donated a range of stationary including pencils, rubbers, rulers and jotters to Emma Ainsley a former pupil at school. Emma, currently a third year student at Glasgow University, is a member of the charity Student Volunteers Abroad and is taking part in a ten week project in the township of Nancholi in southern Malawi. Emma will be teaching in schools throughout the township. Emma has promised to come back into Easdale School in the new school year to give us feedback on the project and show us some photos. Maps, compasses, questions, challenges, songs and marshmallows round the campfire, sunny days and no midgies. 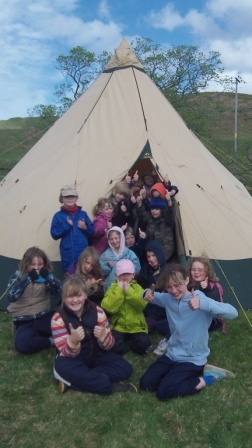 Kilninver primary went camping overnight on Kerrera with Stramash and returned with rosy cheeks. 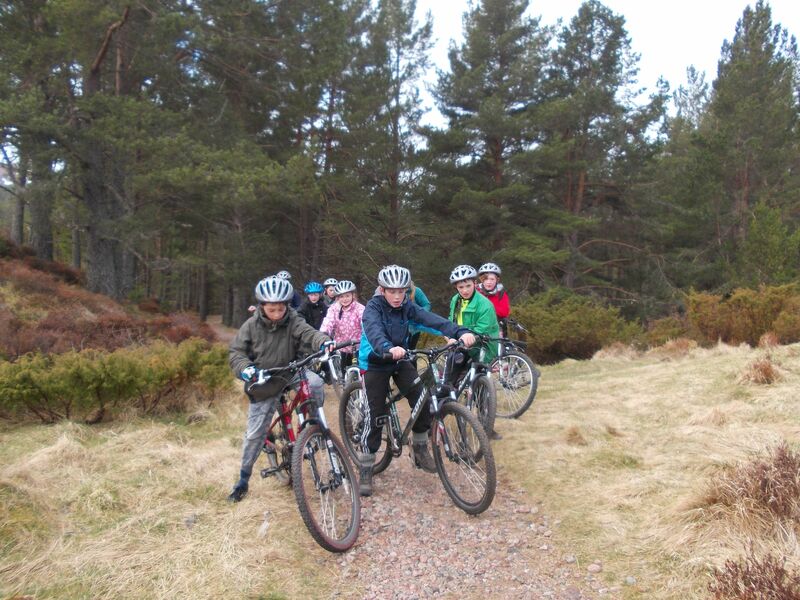 P5,6 and 7 children from both Easdale and Luing traveled to Aviemore last week for two days of outdoor activities. Children experienced lots of new things, taking part in canoeing, sailing and mountain biking. They even had to brave hailstones and snow for the last activity! A great time was had by all children involved.